Personalized Say Anything Sign - - custom made Say Anything Address Plaque. 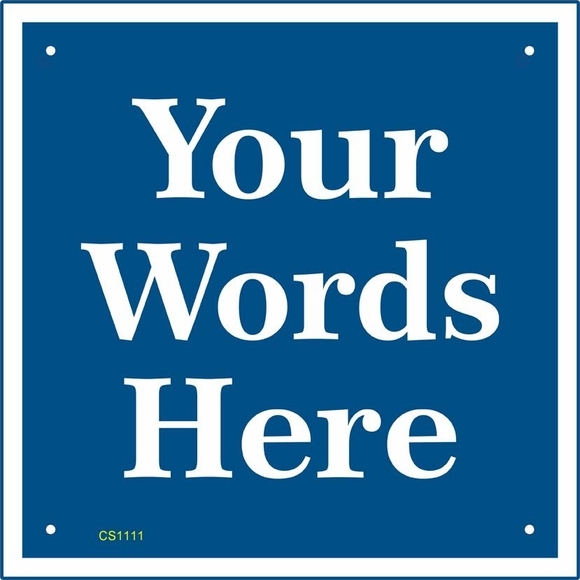 11.5" x 11.5" square sign for whatever words, statement, warning, information, instructions, or address you want visitors to your property to see. Made in USA exclusively for Comfort House. Fast turnaround; ships in 2-3 days. Customized with your choice of color, font, and personalized text. Engraved personalization. Characters and border are permanently engraved into the sign during the production process. Up to four lines of personalization. Each line holds a maximum of eight 2" characters; ten 1.5" characters; or twelve 1" characters. Seven font choices: arial, balloon, century, elegance, script, times new roman (font samples shown in the first small image above). Parking Space Reserved For . . .
Black or white border accent is the same color as the personalization and defines the square shape. Not big enough? Not small enough? Need more lines? Need more character spaces? Need vertical orientation? We will supply your sign any way you require. Please use the Request a Custom Quote link at the top of this page to submit your requirement.